This post explores feedback and feed forward approaches to improve development experiences in new product development (NPD). This post was inspired by a new appreciation of the feedback and feed forward labels in John Boyd’s OODA loop sketch of 1995. OODA Loop sketch that includes feedback, feed forward, and implicit guidance & control. Created by Mark A Hart. Based on a 1995 sketch by John Boyd. A more common and older use of the phrases feedback and feed forward is from the design of control systems for mechanical and electrical devices. To prepare for sharing these insights relating to new product development, I will review simplified electrical circuits that can be used to control the temperature in an electrical, tank-type appliance used to heat and store hot water. 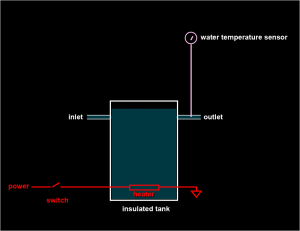 An initial system design includes a tank to store hot water. It includes a heater in an insulated tank. It includes a switch to activate the heater and a sensor to measure the water temperature. The water temperature is regulated by turning the heater switch on and off. A more sophisticated design would permit a user to input a set point for the desired water temperature. Ideally, the system would provide water at the set point temperature regardless of how much water was used for any task. 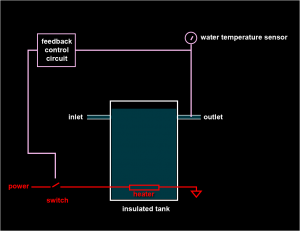 When a feedback approach is implemented, the temperature of the water exiting the tank is measured and that information is used to control the heater circuit. This type of control is a feedback approach because the temperature sensor is after the circuit element producing the heat. Feedback is an approach that uses information about current results to influence operation in the present. It includes modifications to a system based on results. Feedback produces a reactive response. This approach may be referred to as closed-loop feedback. 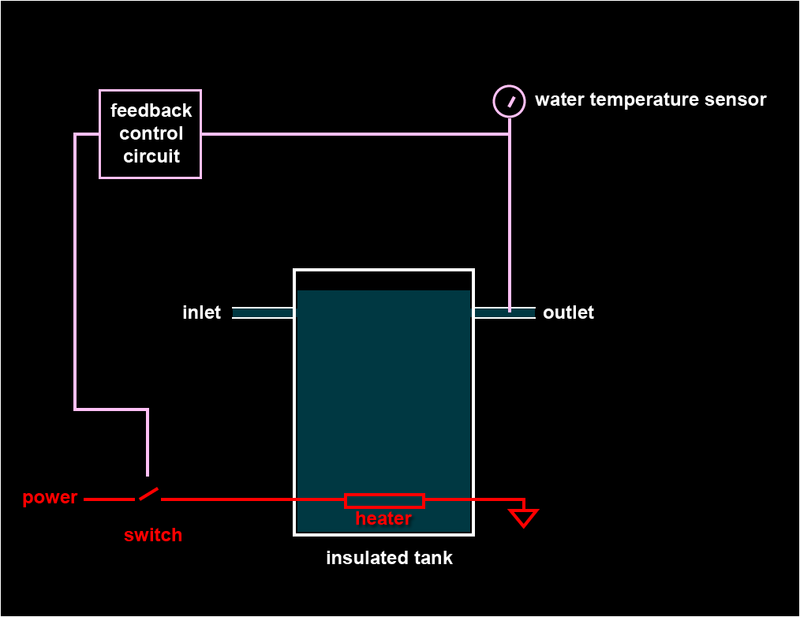 For this design, there is a characteristic lag (a delay after hot water is depleted before the heater is activated to raise the water temperature) and overshoot (a condition caused by exceeding the temperature set point because of a delay in deactivating the heater). 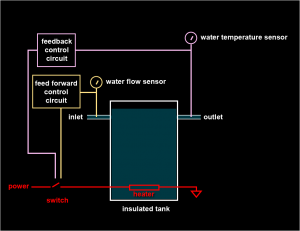 An unsophisticated control circuit can not distinguish a scenario when a small amount of water is used or when a significant amount of water is used. 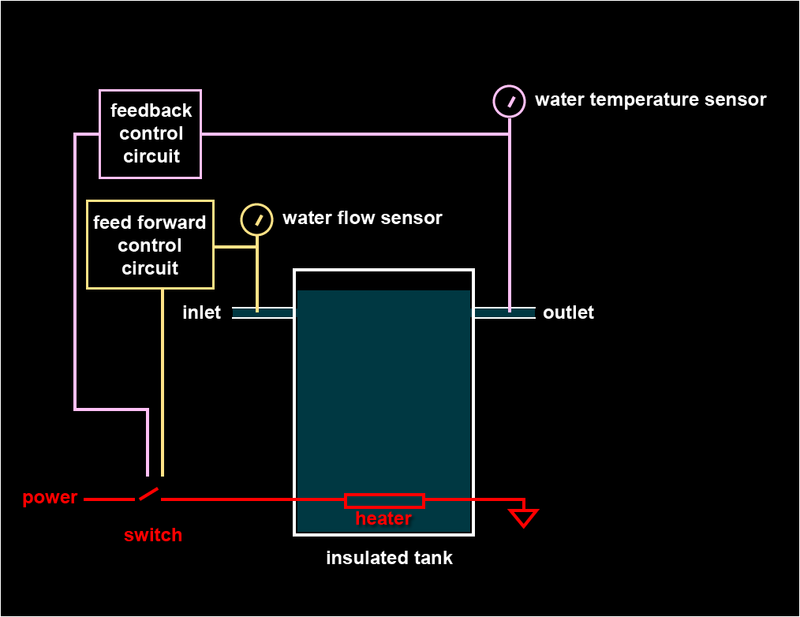 One implementation of a feed forward approach senses the amount of cold water entering the tank. 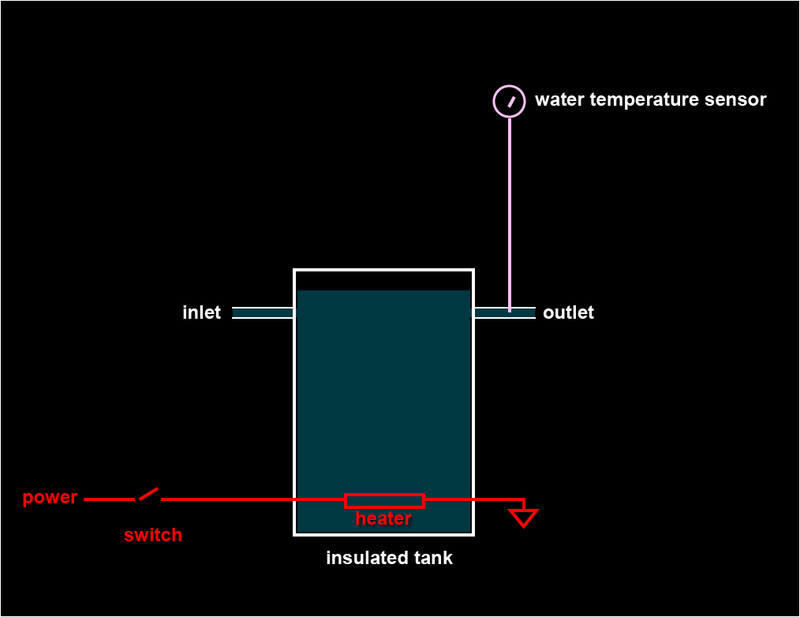 The heater is turned on as a function of the amount of cold water entering the tank. This approach uses knowledge about the system to predict how much additional heat will be required. Such an approach is proactive. Feed forward is an approach that uses knowledge about the system to transmit a controlling signal from a source to a destination. A feed forward approach is a rules-based approach. A feed forward approach should be used with a feedback system. These are complementary approaches. The combination provides a system that is more responsive and more effective. There are examples of analogous approaches in new product development. During new product development, it is common to present product prototypes to potential customers and gather feedback. Prototypes can take the form of surveys, A/B tests, and other interactions with hardware, software, and concepts. This approach may be associated with other popular phrases such as ‘fail fast’ or ’safe to fail experiments’ where learning follows the development of a prototype. Another popular version of this type of approach includes the concept of a minimum viable product (MVP). Like other feedback approaches, these approaches are reactive approaches. There is a lag between ideation and observing results. There is a lag between research, developing an approach to the problem, decisions, and actions and the results from the unfolding interaction with those efforts. In a feed forward approach, a controlling signal is transmitted from a source to a destination. This is more a sophisticated approach than a simple handoff from one person to another. This is more effective than operating in silos. The control signal is persistent. Rules shape the next steps. Rules may be explicit. Exceptions to rules may be permitted. Rules are propagated to the next development effort. A feed forward approach benefits from the involvement of proficient practitioners. In a feed forward approach, training precedes effort. Training precedes the development of a prototype. A design thinking approach is consistent with the concept of a feed forward approach. Feedback and feed forward approaches provide advantages in system controllers and new product development. Now that you understand how to differentiate feedback approaches from feed forward approaches, take some time to classify some of your most frequently used methodologies. Where there is feedback control, you can investigate ways to reduce the lag time following decisions and actions. You can review how feedback from prototypes is evaluated and incorporated into your efforts. Where there is feed forward control, you can determine how investments in mastering the fundamentals and deliberative practice can enable you to do things that are beyond your current ability. Embrace more diversity in how problems are framed and solved. Learn faster ways to correct mistakes. In John Boyd’s OODA loop sketch of 1995, feedback is indicated between Decision and Observations. Feedback is indicated between Action and Observations. Feedback is implied between the Unfolding Interaction with Environment and Observations. In new product development, it is common to present product prototypes to potential customers and gather feedback. There is a lag between research, developing an approach to the problem, decisions, and actions and the results from the unfolding interaction with those efforts. There are two implicit guidance & control labels in the OODA Loop sketch. Implicit guidance & control combines the best attributes of feedback and feed forward approaches. These will be explored in another post. Feedback, feed forward, and implicit guidance & control approaches provide advantages that include improved agility, better accuracy, and more effectiveness. These advantages contribute to better development experiences in new product development. This post included extracts from “Developing Winners: Assimilating the Insights Encapsulated in Boyd’s OODA Loop” by OpLaunch founder, Mark A Hart. Feedback and Feed Forward Approaches in New Product Development. This podcast is available on iTunes. Search for Development Experience.